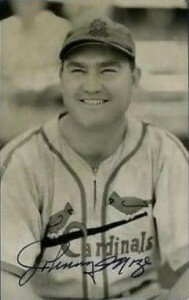 Johnny Mize possessed the rare ability to hit for power and average. During his 15-year career, he amassed 359 home runs while hitting for a lifetime batting average of .312. He played on five World Series-winning teams while with the New York Yankees. His early years were spent with the St. Louis Cardinals before moving on to the New York Giants. 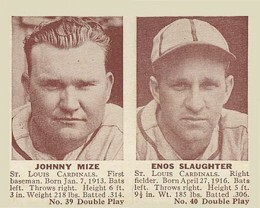 Each team he played for has passionate fan bases and, as a result, Johnny Mize cards and memorabilia are popular with fans and collectors of both clubs. 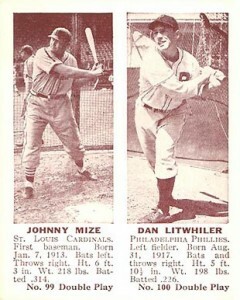 Mize has numerous cards from the early part of his career. Designating which one is his rookie card has been the topic of debate among vintage collectors for years. Many of the issues he appears in are regional releases tied to various retail products. His first appearance in a baseball set is in 1936 Pastels. The set is often referred to by its American Card Catalog designation R312. 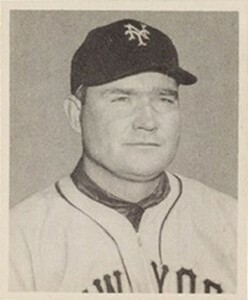 One of Mize's more widely available cards was issued in 1941 Double Play. He has two cards in the set, one pairing him with Enos Slaughter and the other with Dan Litwhiler. 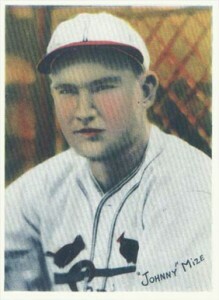 Despite having numerous earlier cardboard appearances, many vintage experts consider Johnny Mize's true rookie card to be 1948 Bowman. 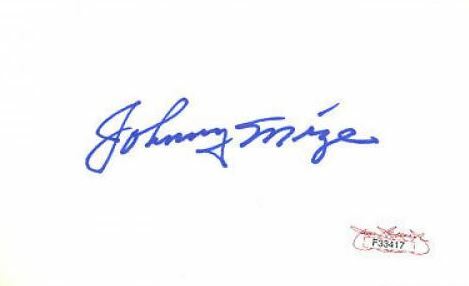 Johnny Mize's first autographed card was part of the relatively obscure 1983 American Softball Association set. It is his only on-card autograph. Mize died in 1993 and all subsequent autograph cards are cut signatures. His first card of this type is from the 2001 SP Legendary Cuts set. It is serial numbered to 84 total copies. His first memorabilia cards were also released in 2001. Topps, Fleer, and Upper Deck all produced game-used memorabilia cards of Mize. All but one of the cards contains a piece of game-used bat. The exception is Mize's card from 2001 Bowman Heritage. This card is a seat relic and contains a piece of the bleachers from the old Polo Grounds stadium. 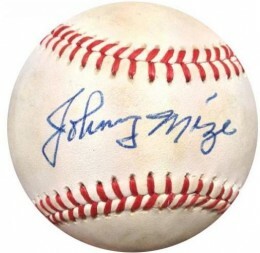 Being a Hall of Famer makes Johnny Mize's signature very collectible. The majority of the authentic examples found today are paper collectibles in the form of signed index cards, checks, photographs, trading cards and cut signatures. These cards are often referred to as "Pastels" due to their post printing colorization. You can see this in Mize's rosy red cheeks. The card measures 4 by 5-3/8 inches. This is one of two cards Mize has within the set. This is the more valuable of the two due to the fact that he is paired with fellow Hall of Famer Enos Slaughter. The card measures 2-1/2 by 3-1/8 inches. Another dual-player card, this one isn't worth as much. However, that might appeal to some more casual fans who are more interested in Mize rather than who he's paired with. This classic image was taken late in Mize's career and is considered to be one of the key cards in the set. The cards measure 2-1/16 by 2-1/2 inches. The black and white photography has been a favorite of vintage collectors for years. 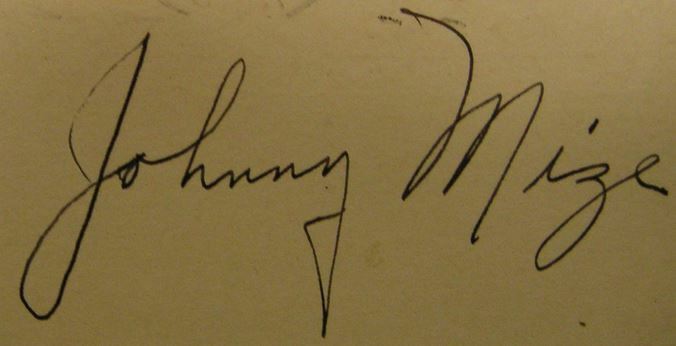 Below you will find an example of what Johnny Mize's authentic signature looks like. This can be used as a first point of reference for determining the legitimacy of autograph memorabilia, but is not a substitute for having your items authenticated by a well-respected professional autograph authentication company. Some of the trusted sources within the sports memorabilia market include the following companies: PSA, JSA, Steiner, Mounted Memories and Tristar. Click on any of the images below to view full size photos. The signature is written in cursive on a relatively even horizontal plane. Each of the letters are legible. The "J" and "M" are larger than the other letters. The "J" has a distinct vertical line on a slight angle. The top loop forms a backwards "D" shape. The bottom loop forms an elongated tear-drop shape. The "o" has a small opening in the center. The "h" has a long narrow loop on the vertical line. The "n"s are small but discernible and written almost identically. The tail of the "y" drops below the plane and creates an upside-down triangle shape. The "M" starts high with a curved line. The second hump rises slightly above the first. The "z" has a tail similar to the bottom loop of the "J." The "e" has a small opening. Hall of Famer Johnny Mize Signed Baseball - JSA Authenticated DD47990. 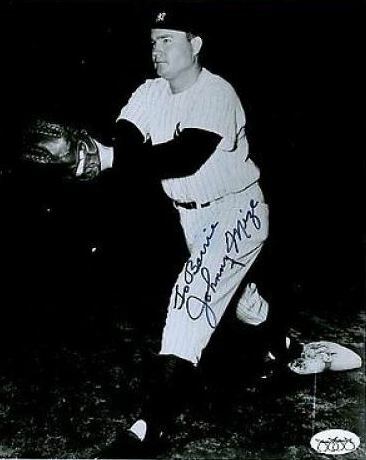 John Robert Johnny Big Cat Mize Signed Autographed 8x10 Baseball Photo JSA COA!